Joshua Bailey scored seven goals and 26 points as a rookie in Owen Sound, but took a giant step forward last season, scoring 22 goals and 61 points in 69 games. Josh Bailey knows hard work can take you a long way in the game of hockey, and he doesn’t have to look any further than Windsor Spitfires coach Bob Boughner for proof. Bailey is a gifted player with great wheels and outstanding vision on the ice, but Boughner made a career out of hard work and says that it’s Bailey’s determination that will take him to the next level. Bailey was a first-round OHL pick of the Owen Sound Attack in 2005, but was shipped to Windsor midway through last season for veteran goalie Anthony Guadagnolo. Owen Sound was looking to make a run at the league championship while Bailey was happy to get the opportunity to play more after stepping out of the shadows of first-round NHL draft picks Bobby Ryan and Trevor Lewis. Bailey scored seven goals and 26 points as a rookie in Owen Sound, but took a giant step forward last season, scoring 22 goals and 61 points in 69 games. He already has seven goals and 20 assists in 22 games this season and consistently is one of the best players on the ice. The Bowmanville, Ontario native started this season with a 14-game point-scoring streak and has been held off the score sheet just four times in 22 games. In their preliminary rankings released last week, McKeen’s ranked Bailey as the 10th-best prospect for this summer’s NHL Entry Draft in Ottawa. Bailey said he doesn’t pay much attention to the rankings, but admits that he feels the pressure of being in his draft year. 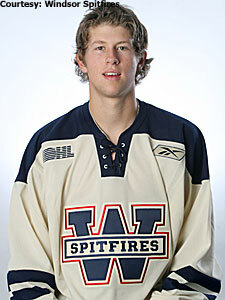 The Spitfires have been one of the biggest surprises in the OHL during the first quarter of the season. After finishing with just 18 wins and out of the playoffs a year ago, they have turned their program around. They already have 13 wins in 22 games and are in first place in the West Division. The Spitfires stormed out of the gate with five straight wins to start the year and Bailey said that helped build their confidence after a tough 2006-07 season. Boughner is in his second season behind the Spitfires’ bench after purchasing the team with fellow NHL alumnus Warren Rychel in 2006. Between them, they piled up 2,800 penalty minutes in the NHL and have instilled an outstanding work ethic into their squad. It’s no surprise Bailey has thrived while playing for Boughner. He is willing to go to the high-traffic areas and uses his 6-foot, 200-pound frame to create room. He worked hard in the summer to get stronger and said the results already are showing. Despite the high praise from his coaches and scouts, Bailey is determined to improve his already impressive two-way game. He says the added strength has helped him compete against older players in the OHL. Bailey picked up a pair of assists in a 5-1 win in Barrie over the Colts that ended Windsor’s six-game losing streak on the weekend. He said it was important that the team broke out of its recent funk.